​Last week the Orlando design team got the news they have been waiting a long time to hear. 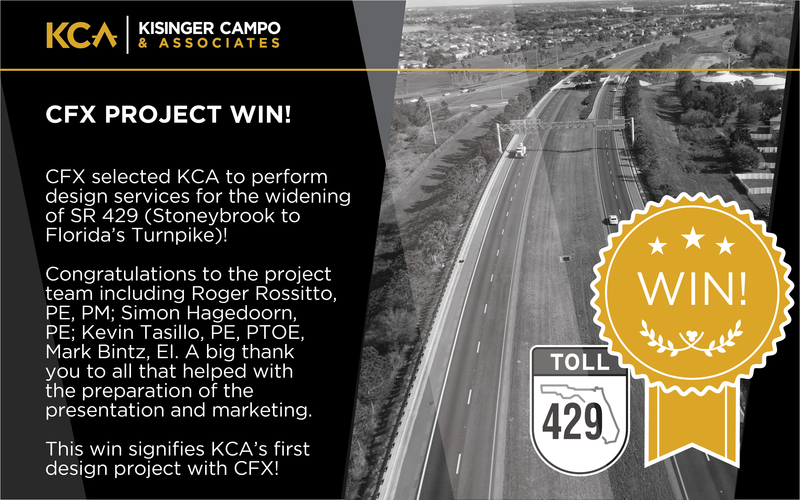 CFX selected KCA to perform design services for the widening of SR 429 (Stoneybrook West to Florida’s Turnpike)! The design services consist of widening to the inside to create an additional general use lane and closing in the median to accommodate future part-time shoulder use. This project is the southern component of an overall plan to widen SR 429 in three segments from Stoneybrook West Parkway (South) to SR 414. This signifies KCA’s first design project with CFX! Congratulations to the team including Roger Rossitto, PE; Simon Hagedoorn, PE; Kevin Tasillo, PE, PTOE; and Mark Bintz, EI. A big thank you to Elisa Guggino, Dave Heyman, Wes Wright, EI, and Michelle L’Italien for the help with preparation and marketing.